(Price per Unit Instead of £140.40. You save £7.02 due to the online discount . The polypropylene (PP) barrier protects areas safely and shields them effectively. The sturdy material is unbreakable and durable, yet also lightweight and easy to carry. Easy transport is made possible by the rotatable bases, which can be turned through 90° for transport to provide a flat profile. 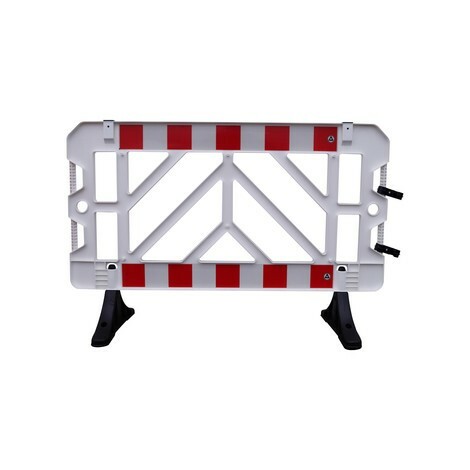 The polypropylene barrier has an M36 screw thread into which signs can be attached. 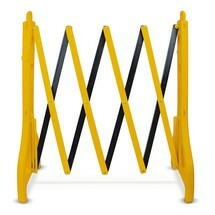 The barrier is quickly adaptable for any application and can therefore be adapted to the respective hazardous situation. The barriers can be easily connected together via the 2 connection clamps. These flexible clamps also allow the barrier to be attached to another around a corner, offering a wide range of possible variations. Order the reflective and easy to transport polypropylene barrier from our shop.